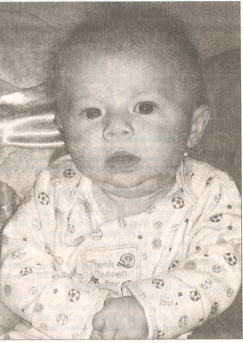 Jaydon Henderson was almost 4 months old when he was found dead March 13 from sudden infant death syndrome. It's been a tough journey for Katelyn Spatenka and Nathaniel Henderson, Jaydon's parents, along with Katelyn's mother, Rhonda Spatenka. "At times," Katelyn says, it's hard. "But for the most part, it's been all right." And now through her grief, Katelyn, 19, has an opportunity to lean more about SIDS and why it happens. Someday, she hopes a cause can be found to explain SIDS and explain ways the death of other babies can be prevented. The death of Jaydon also has given Jaydon's family an opportunity to learn more about SIDS and raise money to prevent it from happening to other parents. According to the Mayo Clinic's Web site, SIDS is the sudden and unexplained death of an infant. Typical cases involve healthy babies who are sleeping but never wake up,. In most cases, no cause is ever found. Katelyn said her son was taking a nap at a daycare on March 13. When it was time to wake Jaydon up from his nap, Katelyn said the caretaker discovered that he wasn't breathing. Emergecy services were called, including Mayo One. But because rescue workers were unable to get any movement or breathing, Jaydon was not taken to the hospital, Katelyn said. It was a tough time for Katelyn, prompting her sympathetic co-workers at United Prairie Bank to do whatever they could to help. During that time, Katelyn learned about the National SIDS Awareness Foundation, and about April 18 -a national day where the organization collects as much money as possilbe to fund more reserach about SIDS. Hoping to do something local, Katelyn and Katy Busho, a personal banker at United Prairie, organized a fundraiser at the bank. For that one day, employees could donate at least $5 for SIDS and have the opportunity to dress down. Busho said employee donations ranged anywhere from $5 to $100. With employee donations and other donations from bank customers, Spatenka said they raised about $575. But they're not finished yet. Her mother, Rhonda Spatenka, said another fundraiser - a spaghetti dinner - will be held from 5 pm to 8 pm Saturday at the VFW in Owatonna. Proceeds will go for medical costs incurred for Jaydon's care, while the remaining proceeds will be donated to the National SIDS Awareness Foundation.